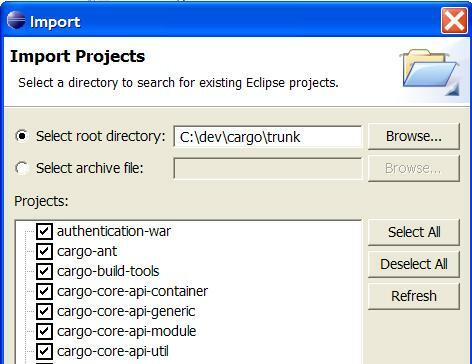 This tutorial explains how to import Cargo's sources into your IDE (Eclipse and IntelliJ IDEA are covered). Start by checking out the Cargo sources - You can do that using the Git command line or GUI-based tools or your IDE Subversion feature. Install the latest version Maven2. Make sure it's installed properly by typing mvn --version. Open a shell in the top level directory where you have checked out the Cargo sources. Type mvn eclipse:eclipse. This generates Eclipse files automatically. Go to Windows|Preferences|Java|Build Path|Classpath Variables and add a M2_REPO variable to point to your local Maven2 repository (usually in ~user/.m2/repository). See also the documentation on the Maven Eclipse plugin. Note: Maven supports a nested directory structure whereas Eclipse currently only supports a flat structure. The Maven2 Eclipse plugin creates an Eclipse project per Maven module (i.e. per directory containing a pom.xml file). This means that directories with no pom.xml will not be listed. This is a known issue with Eclipse and Maven. In the future the hope is that Eclipse will support nested project structure. Type mvn idea:idea. This generates IDEA project files automatically.